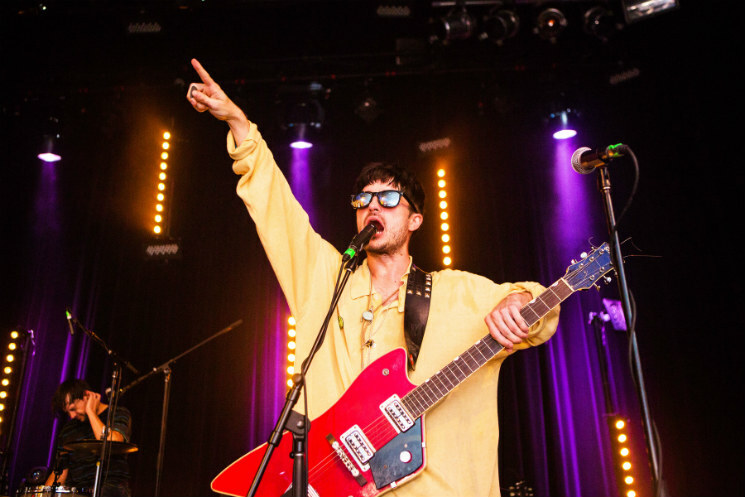 Atlanta-raised garage-rock outfit Black Lips have come a long way since the days of whipping their dicks out onstage. It's been over 15 years since their formation, and although the band still manage to seem like they're having as much fun as possible on stage, these days, their hijinks are more charming than horrific. It took five full songs before guitarist/vocalist Cole Alexander spat on the crowd/himself, and outside of a particularly vile loogie being hocked into the air and returning to his mouth moments later, the only bodily fluids shared by the band with the crowd was their sweat. They may not be a tight unit, at least by traditional music standards, but there's something special about witnessing their controlled chaos in a live setting, and for their very first show in Quebec City, they pulled out all the stops. Delivering an eclectic set that emphasized the more popular tracks from their two most recent albums — 2011's Arabia Mountain and 2014's Underneath the Rainbow — as well as older hits from breakout Good Bad Not Evil like "O Katrina!" and "Bad Kids," the southern-fried and grisly rock group's democratic approach to singing and songwriting allowed each of its members more than a couple of well-deserved moments to shine in the spotlight. It's hard to not still have a soft spot in one's heart for Ian Saint Pé, the grill-wearing guitarist who departed the group for more comfortable digs a little over a year ago, after a decade with the band. But it's impossible to deny the raw talent and charisma of the band's first lead six-stringer, the recent returned Jack Hines, who, judging by their Festival d'été performance, probably spent the last ten years practicing how to crowd surf with a guitar in hand like a champ. But it wasn't just the band that made their Sunday night (July 12) set special: let it be known that Quebec City has some of the best crowds in the country. Even though sing-alongs were subdued at times due to language barriers, it was rare to not find a set of hands waving wildly in the air, or a pair of bodies being thrown to and fro atop the crowd all night long, which was something Alexander caught on to almost immediately. "I don't know why we haven't been here before," he stated to their adoring audience early on in the set, "but I know we're coming back."